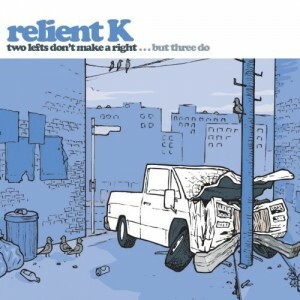 Two years and a forgettable EP later, Relient K released their third and best album to date. Two Lefts Don’t Make a Right… But Three Do — besides making the band 2 for 3 on awful album names — took all of the enjoyable elements of the first two releases, amplified them, weeded out most of the bad, and put it into a fun, messy, exciting product. The sound, aside from feeling significantly more polished, is not drastically different from Anatomy: it’s still straightforward pop with a “punk” edge to it, along the lines of Blink 182 or Sum 41. But the band’s touch is much more deft this time. The riffs are less repetitive and grating, the performances are stronger, and the band just gels together a little bit better. What really makes Two Lefts great, though, are the songs. Every song deals with some sort of coming-of-age theme, yet most of the tracks retain their fun. It’s a tough balancing act to pull: The music here is at once accessible, reflective, and substantial. And the writing has aged well; seven years later, Thiessen’s humility seems more relevant than ever. My favorite trick of Thiessen’s is his knack for hiding some broad observations and repressed emotions behind little images and sly jokes. Take, for instance, “In Love With the ’80s,” the album’s fifth track. On the surface, it’s a bunch of cultural references. But, underneath that surface, the song warns of the danger in fixating on the past (e.g. “Live without a care / what could possibly go wrong?”). It’s a small touch, but a key one, because it gives the song a place in the album’s thematic arc. The band repeats follows this pattern of adding meaning to the silliness on numerous occasions on Two Lefts; “Mood Rings” is about illogical emotion (courtesy of females), “Gibberish” is an extended “shut up” gag that makes a commentary on the importance of healthy communication, etc. Among the album’s standout songs are “Chap Stick, Chapped Lips, and Things Like Chemistry,” the opening track, which is three minutes of perfection. Thiessen riffs on theme parks and cell phones and relationships and back again, all with stellar guitars, drums, and “na na na” harmonies. “Forward Motion,” which slows down after a passable intro guitar solo, also excels. Beyond the clever lyrics (“Experience the bittersweet / to taste defeat then brush my teeth / ’cause I struggle with forward motion”), the song rocks harder than anything on the band’s first two albums, yet ends on a gentle piano riff. Those two, “In Love With the ’80s,” and ballad “Getting Into You” — which is just as good as Anatomy’s “For the Moments I Feel Faint” without being so proselytizing — are among the strongest tracks here. But there’s hardly a weak track in these 14. The whole album coheres into a lament of the pitfalls of suburbia — or, more generally, complacency and shallowness. Even the joke track at the end of the album is strong, the funniest the band’s ever done. What’s most refreshing about Two Lefts is that we get our first peek at Thiessen being a truly brilliant writer. His lyrics are incredibly shrewd in spite of the silliness. Humility and spirituality, which come from Thiessen’s roots as a Christian worship leader, give the album a warm, contemplative center that lends his music poignancy. Three albums in, his writing was pretty strong, and it would only grow better with time. The band would soon grow more sophisticated and polished, but Two Lefts remains Relient K’s masterpiece. It retains their early exuberance but packs an emotional punch as strong as their more recent work. The transition between quirky, small-time band to major-label artist is captured here, and it has the best of both worlds.